The complaints of headaches, bloody noses and asthma by Porter Ranch residents sound all to familiar to eastside activists who’ve spent years fighting their own large scale local environmental health hazard. So are the demands for government officials to immediately shut down Southern California Gas Co.’s natural gas storage facilities near Porter Ranch that residents blame for their health crisis. Strikingly different, however, has been the response from state regulators and elected officials – including Gov. Jerry Brown –who for years failed to take the same level of bold action to stop Vernon-based Exide Technologies from putting the lives of thousands of east and southeast working class, predominately Latino residents at risk. Money, race and political power are at the root of the inequity, activists claim. Armed with high-powered attorneys, residents in Porter Ranch are demanding the closure of SoCal Gas’ Aliso Canyon facility where a leak was discovered Oct. 23, leading to hundreds of complaints from residents about negative health effects and demands for the utility company to pay to relocate residents in the impacted area. In less than three months more than 2,000 residents have been relocated, schools have been shut down, students were moved and the company is expected to pay for the housing of pets and additional policing. No one denies the seriousness of the problem in Porter Ranch, but east and southeast area residents and activists can’t help feeling there’s a double standard at play, especially when it comes to Gov. Brown who last week declared a State of Emergency in Porter Ranch after touring the Aliso Canyon facility and meeting with affected residents, something he’s failed to do in the Exide case. His declaration allows the state to mobilize the necessary state personnel, equipment and facilities, and to waive any laws or regulations in place to deal with the environmental issue. It also gives the governor power to allocate emergency funding to fix the leak, which is expected to take three to four months to repair. Boyle Heights resident Doelorez Mejia was pleased to see the quick call to action by the governor and state officials in Porter Ranch, but couldn’t help feeling the injustice of the situation. She was referring to the years that pleas from residents living near the Exide acid-lead battery recycling plant were ignored. 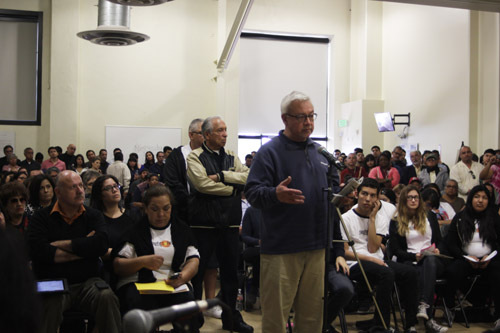 And the dozens of meetings where residents testified about the people – young and old – in their families with cancer, children with learning disabilities and other illnesses they say can be blamed on years of breathing in the toxic chemicals spewing from the Exide plant. In 2013, air quality officials reported that Exide had violated toxic chemical emissions putting more than 110,000 east and southeast area residents at a higher-risk of cancer. Lead and arsenic had been found in the soil at nearby homes and at least one park. 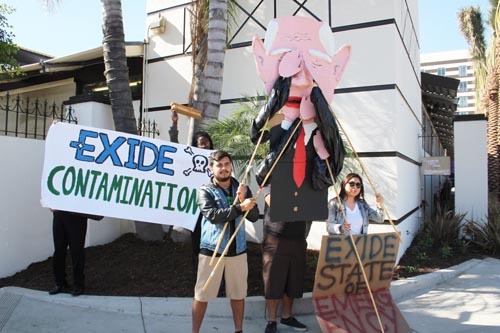 It wasn’t the first time Exide had violated state standards on toxic emissions, nor would it be the last. But unlike in Porter Ranch, demands around Exide went unheeded. 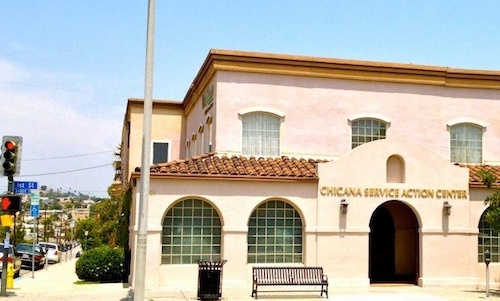 Residents were not relocated, classes were not cancelled and the facility could not be closed despite operating for decades on a temporary permit issued by the California Department of Toxic Substance Control (DTSC). Public outcry during dozens of community meetings, hearings and protest marches over their exposure to toxic levels of arsenic and lead – known to cause permanent neurological damage to children and pregnant woman – failed to force the closure of the facility. In fact, it took the U.S. Attorney’s Office stepping in and strong-arming Exide – with the threat of federal criminal charges – to agree to a negotiated permanent shut down in April 2015. Testing and air emission modeling in the area now show that as many as two million people may be at an elevated risk for cancer and other health issues due to years of exposure to lead from the Exide plant. State toxic regulators now believe that upwards of 10,000 properties may need to be tested and decontaminated. So far, only 184 contaminated properties have been cleaned. Exide was allowed to open adjacent to homes that had been in the area for generations. In Porter Ranch, city planners had allowed developers to build on vacant land next the Aliso Canyon facility, which had been there for decades. Boyle Heights resident Teresa Marquez acknowledges that both the Porter Ranch and Exide environmental hazards pose a threat to public health, but says she knew the response would be drastically different in Porter Ranch, since even at the local level public officials have been more active in the Valley. Boyle Heights is a neighborhood in the city of Los Angeles, Marquez pointed out, yet Mayor Eric Garcetti has not made an appearance at an Exide meeting or made public statements calling for a prompt response the way he has about the gas leak, she said disappointingly. Where’s the city attorney, who is now filing lawsuits to protect Porter Ranch residents? Porter Ranch is a more affluent Los Angeles neighborhood located at the northwest edge of the San Fernando Valley. Its residents are mostly white, with a medium household income of over $120,000. In contrast, Exide’s contamination impacts the highly dense communities of Bell, Boyle Heights, Commerce, unincorporated East Los Angeles, Huntington Park, Maywood and Vernon; all home to mostly working class Latinos. “I can’t help but wonder why the horrible disaster at Porter Ranch has captured so much attention, while the equally horrible disaster at Exide has captured so little,” Los Angeles County Board Supervisor Chair Hilda L. Solis told EGP in an emailed statement. It was not until the facility was forced to close that eastside residents began to see elected officials take notice of their concerns, said Marquez. But even as they celebrated that victory many residents knew the challenge ahead was cleaning up the lead from dirt that to this day prevent children from playing in their own backyards. “They wouldn’t dare relocate [Porter Ranch] families into our communities,” said Mark Lopez, executive director of East Yard Communities for Environmental Justice. Late last year Brown attended a hotel opening in Bell Gardens, not far from Exide. Lopez and other eastside residents were also there, outside angrily protesting the governor’s silence on Exide. They carried signs and a 10-foot paper-mache effigy of Brown. Unlike in Porter Ranch, the governor has yet to visit communities impacted by Exide or publicly comment on the long-playing Exide environmental crisis, despite it now being called one of the largest public health disasters in the state’s history. Gladys Limon, staff attorney for Communities for a Better Environment told EGP the governor’s and state agencies’ responses to the Porter Ranch catastrophe reveal a stark racial disparity in efforts to protect communities from health and safety risks caused by industrial operations. “The state neglected the thousands of families in Southeast and East L.A. for decades, and the Governor to this day has failed to personally acknowledge the Exide health emergency and to meet with residents,” she said. 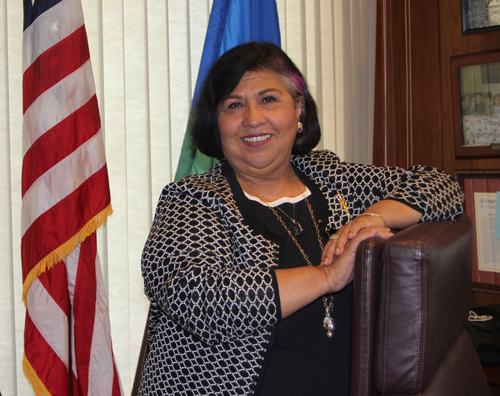 Former County Supervisor Gloria Molina told EGP that she continuously called the governor’s office to get him to take action, but never got a call back. “The governor is totally uninterested,” she said, adding it may have something to do with the low number of registered voters in the area. “He takes pride in being the environmental governor but he seems more interested in protecting trees than people,” Molina said. Some environmental activists say they believe the governor’s response to the Aliso Canyon gas leak may be more in line with his commitment to be the world’s leader in reducing greenhouse emissions, than about health concerns. Marquez said she was surprised to hear Brown had met with Porter Ranch residents. 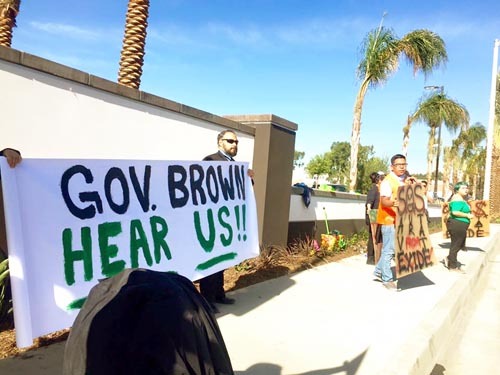 EGP reached out to the governor to get his response to concerns by eastside residents that he has been indifferent to their plight, but, in keeping with the criticism from the community and elected officials, Brown again failed to personally comment on the situation. Instead he passed off our request to the Department of Toxic Substance Control, the state regulatory agency in charge of the cleanup, which has for years been strongly criticized for its handling of Exide. “Protecting the community around the Exide Technologies facility in Vernon is a high priority for the Administration,” reads the response from DTSC spokesman Sandy Nax, who credited the governor for providing additional funding for the residential sampling and cleanups currently underway. 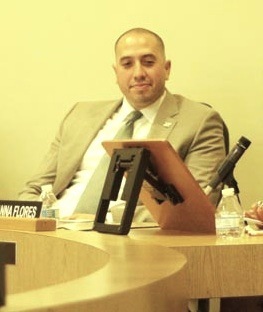 Bell Councilman Nestor Valencia told EGP he and other area residents have criticized DTSC for moving too slowly with soil sample tests and the clean up of properties. “It goes to show the disparity of the southeast and East Los Angeles communities [compared] to other communities,” he said. Residents just want the same response they saw in the Valley, Huntington Park Mayor Karina Macias told EGP. They want the same protocols for all communities, she said. Instead of hope, Mejia says the response by elected officials to the Porter Ranch disaster reaffirms what she already knew. A version of this article was published by Eastern Group Publications in the January 14, 2016 print editions. [Update 1:30p.m:] Added additional comments by residents. Charter Amendment 1 – Shall Elections Change to Even Number Years for L.A. City? Charter Amendment 2 – Shall Election Change to Even Number Years for LAUSD? This endorsement has been one of the most difficult for EGP to make in along time. The 14th Council District is lucky to have such a talented pool of candidates from which to choose, including two seasoned elected official who have each served residents of the district and the County well. Many in the community have told us they too are torn, and believe that both former L.A. County Supervisor Gloria Molina and incumbent Councilman Jose Huizar each have strong records to stand on. They say both have done an excellent job of getting things done for their constituents, of turning big ideas into big realities by breaking down the bureaucracy that often stands in the way. 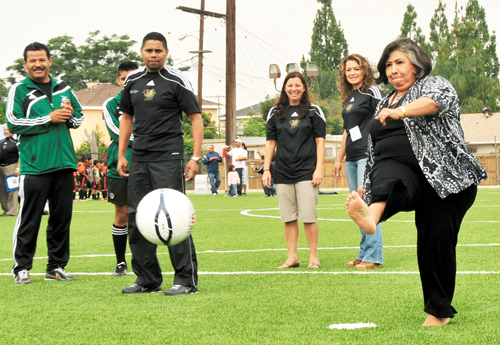 Molina deserves praise for her persistence on the Gold Line Extension to the eastside, development of the East Los Angeles Civic Center and for building transitional housing and more recently, her tough negotiations to get Grand Park in Downtown Los Angeles funded and open, and to insist on a set aside for affordable housing in the Grand Park plan. We also respect her determination to ensure that the history and culture of Mexicans, Mexican Americans and Latinos in Los Angeles be preserved and respected, opening LA Plaza de Cultura y Artes to Angelenos and visitors. And who can forget her battle with her former fellow supervisors over more hospital beds at the planned County USC Hospital? Or her strident resolve to fund services for the undocumented and to keep the County budget balanced through hard times, even through angry threats from County employees? But on the Board of Supervisors she was one of five, on the Los Angeles City Council she would be one of 15, a far more difficult arena to negotiate. Much has been made of her temperament and public dressing down of county employees, and rightly so, especially given that to date she has not yet said whether she would seek a second or third term. She will need cooperation from her peers on the council and the bureaucrats who will still be working when she leaves office, to get anything done. 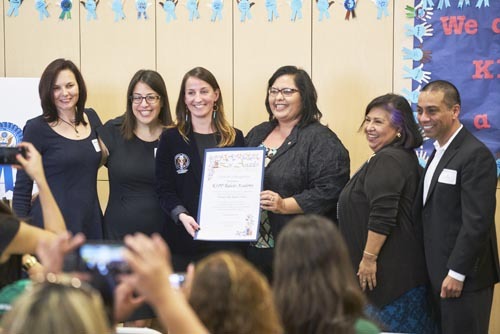 Huizar also has his share of accomplishments, both as a councilman and as former member of the LA Unified school board, where he spearheaded the successful effort to build the first new high school on the eastside in 85 years. During his term on the city council he has had to work to gain support from his fellow members of the council on funding priorities for the 14th District. We believe he has made significant gains, from preserving open space to making improvements to parks and recreation centers, building affordable housing and spurring job creation by attracting more business to CD-14. He’s been criticized for not getting enough accomplished since taking office, but the reality is that many projects take years to come to fruition, especially when there is money to be found and public input to be obtained. Many of the district’s commercial corridors are more vibrant and booming with activity than when Huizar took office, in our view that’s important. Have all the streets been repaired and trees trimmed? No, but we have heard from residents that they see an improvement despite the city’s lack of sufficient funding to get the job done. Gentrification in East and Northeast Los Angeles is happening and will continue. But not all gentrification is bad and it can be respectful of the community, acting as a conduit to improved services and opportunities and greater pride in one’s neighborhood. Huizar’s effort to rebuild downtown has been positive for the city, bringing entertainment, shopping, jobs and art closer to east and northeast neighborhoods and preserving some of the city’s most beautiful and significant architecture for future generations. This experience is made more accessible by improvements to our Metro rail system. We believe Huizar has contributed to the re-vitalization of many neighborhoods in the district, where families can now enjoy working and meeting their neighbors in a safer environment. We are, however, concerned about the councilman’s over enthusiastic support for designating streets as bike lanes suitable. We encourage him to give more attention to those opposed, such as fire, police and emergency vehicles, and businesses that sell products and not just food and drink. Huizar has been no stranger to controversy, and we were disappointed by his actions involving a former member of his staff who sued him for sexual harassment, though he claims it was a consensual extramarital affair, which he has apologized for. The case was settled out of court but not before city taxpayers paid $200,000 to defend the councilman. Two of the other three candidates in the race, Nadine Diaz and Mario Chavez have been good advocates for their community and we see potential as future leaders. They are to be commended for stepping up to the challenge. But in our view, Councilman Jose Huizar has earned another term on the council and the opportunity to continue the progress underway. Therefore, we endorse Jose Huizar in the 14th District. El 19 de febrero de 1991, Gloria Molina un tanto nerviosa asumió el cargo en la Junta de Supervisores del Condado de Los Ángeles, haciendo historia en ser la primera latina elegida en la mesa directiva de cinco personas. Un trabajo que fácilmente mantendría por los próximos 24 años, sin embargo, ese día la presión era enorme. “Fueron nervios devastadores”, recordó Molina desde su escritorio en el edificio Kenneth Hahn Hall en una de las últimas veces que estaría ahí antes de dejar su puesto debido a límites de mandato. Su oficina casi vacía; maquillaje recogido en una bolsita zip lock, lapiceros y lápices unidos con una liga, retratos, reconocimientos, fotos y otros recuerdos que Molina se llevará de su oficina, la cual da una vista amplia hacia el horizonte de la ciudad. “Me siento bien al partir, es sólo una despedida con mi personal … es como tener fiesta con la familia, esa parte es difícil”, dijo la supervisora de 66 años antes de limpiarse algunas lágrimas. Aún más difícil es dejar proyectos sin terminar. “Denme otros seis meses”, agregó a media broma. Durante más de dos décadas, Molina ha representado un distrito diverso que se extiende desde algunas regiones bastante conservadoras hasta áreas no incorporadas que dependen en gran medida de sus servicios, incluyendo el Este de Los Ángeles. Al retroceder el tiempo, había mucho en juego. “Muchas personas no apoyaban que yo llegara aquí”, le dijo a EGP. También estaba la comunidad latina, marginalizada, poco representada, y quienes tenían altas expectativas acerca de la primera latina en la historia en ser elegida para la Asamblea Estatal de California (1982) y como concejal del Ayuntamiento de Los Ángeles (1987) y posteriormente como supervisora. Esas expectativas, junto a su participación en el movimiento chicano y su punto de vista feminista—los cuales ambos eran acerca de empoderar a las personas—influenciarían para la toma de sus decisiones por las siguientes dos décadas. “Cuando tienes estos roles de liderazgo no sólo te están viendo como una funcionaria electa o supervisora”, dijo Molina. “Eres una supervisora Latina, eres una mujer supervisora”. Y ya sea que las personas lo reconozcan o no, es una “reflexión en todos nosotros como comunidad”, dice Molina. Molina reconoce grandemente la ayuda de su personal, muchos quienes han estado con ella desde sus tiempos en la asamblea, le han ayudado en la transición de su puesto en el consejo de la ciudad de Los Ángeles y a la junta del condado como supervisora representando a más de dos millones de personas repartidas por diferentes ciudades y miles en territorio no incorporado del primer distrito. En ese momento, “Mi prioridad era [tratar de ver] cómo me iba a comunicar con mis constituyentes”, dijo Molina, agregando que le tomó tres años para tener todo en orden. En sus más de 30 años de servicio público Molina transformó su distrito, más notablemente en el lado este. Mientras estaba en la asamblea, Molina luchó junto a las Madres del Este de Los Ángeles contra la construcción de una prisión en el Este de LA. Ella ayudó a asignar $54 millones—incluyendo millones de sus fondos discrecionales—para mantener viva LA Plaza de Cultura y Artes en el centro de Los Ángeles, la cual se dedica a “cultivar la apreciación de las influencias culturales mexicanas y mexicano-americanas”. Como supervisora, Molina ayudó a crear la Extensión de la Línea Dorada al Este, que conecta el lado este con el resto del condado de Los Ángeles; el Centro de Tránsito de El Monte, el Grand Park en el centro de LA; el Centro Comercial la Alameda, el Centro Médico LAC+USC, el Centro Wellness en el Hospital General y los $30,4 millones invertidos en la renovación del Centro Cívico del este. Le dijo a EGP que esta muy orgullosa de su trabajo en la renovación del centro cívico, el cual incluye una biblioteca, parque y oficinas del condado. Molina estuvo en el parque la semana pasada durante la celebración de inicio de “Winter Wonderland” donde visitó a niños en la biblioteca, en la pista de patinaje y compartió sus alegrías durante la encendida del árbol de navidad. Un gran contraste a cuando la gente veía ese parque como “peligroso”, dijo, recordando que “no estaba bien iluminado, las pandillas se habían apoderado del parque”. “Ahora esta abierto, es espacioso, tiene brillo. Tiene una biblioteca nueva, tiene un centro cívico … todo es bueno ahí”. Conseguir financiación y la aceptación del resto de sus colegas en la junta no era fácil. La supervisora le dijo a EGP que la re-construcción del Hospital General del Condado fue uno de los proyectos más importantes y uno de los más difíciles para que ella consiguiera que el resto de la junta entendiera que había una necesidad enorme para poner más camas en el hospital. “Fue uno de mis momentos más desalentadores en la junta de supervisores”, dijo. “Nunca había visto a cuatro de mis colegas darle la espalda al primer distrito, como lo hicieron”. Obtener financiación para el Grand Park—un área de cuatro cuadras localizado entre el Music Center y el City Hall—también fue un desafío, según Molina. Igual que era convencer a la junta que ayudaran a LA Plaza. Sin embargo, el mes pasado, para asegurar el futuro de LA Plaza, Molina ganó el voto de la junta para aprobar $135 millones para desarrollo de uso mixto el cual generará fondos para apoyar a la organización en las siguientes décadas. Los desafíos son más difíciles cuando eres mujer, según Molina. “Todavía hay una gran cantidad de sexismo en la junta, una gran cantidad de sexismo con los jefes del departamento y otros”, le dijo a EGP. “Ellos no lo quieren decir, pero es su naturaleza”. “Pero también tiene que ver con el hecho de ser la única mexicana”, dijo, señalando que de vez en cuando tratan de ignorarla. “Es por eso que puedo ser una…voz tan alta”, se ríe. “Pero está bien, nunca dejo que eso me debilite en lo que tengo que hacer”. Sin embargo, agrega que algunos de sus más grandes retos en realidad han venido de los electores. Recordó la oposición de la construcción de un proyecto de vivienda para madres solteras en City Terrace a principios de los 90s. Hubo muchas protestas, dijo. Pero “algunas veces tengo que hacer las cosas a pesar de que haya cierta oposición”, explicó. Molina, una demócrata, dice que no le incomoda ser etiquetada como una fiscal conservadora. Dice que ajustar el presupuesto ha dado sus frutos para el condado, que resistió a la Gran Recesión mejor que muchos otros municipios, incluido el estado y la ciudad de Los Ángeles. Al preguntarle cómo quiere que la gente recuerde su desempeño como supervisora, Molina responde que ella espera que sea como una defensora, y lo más importante, como alguien que los escuchó. “Espero que me recuerden como una campeona porque realmente he trabajado duro para defender los derechos de todos y los derechos de mi comunidad y [solucionado algunos] problemas”, dijo. “Mucha gente piensa que soy muy testaruda, pero yo me muevo de acuerdo a los problemas de mi comunidad”. Pero Molina también tiene un lado más tranquilo, que incluye cocinar en casa, hacer jardinería, ver películas clásicas y coser después de un largo día de trabajo. En algún momento pensó en tener una carrera en la moda, pero en estos días solo cose y acolcha para sacar su lado creativo. Probablemente pocos saben que a ella le gusta escribir, dibujar caricaturas e incluso ha escrito un esquema para una comedia que involucra a latinos y que espera un día completar. “Tengo ideas todo el tiempo y las escribo”, dice ella, rompiendo a reír cuando se da cuenta que ha revelado su sueño secreto. Los años la han hecho más paciente, Molina le dijo a EGP. Ella admite haber prejuzgado algunas personas sólo para descubrir que estaba equivocada. “Nunca pensé que tendría una [amistad] con Mike Antonovich”, Molina le dijo a EGP. “No estamos de acuerdo en todo, pero hemos tenido una relación sólida”. En reunión de la junta del martes, Antonovich respaldó la candidatura de Molina para desbancar al concejal José Huizar en las elecciones de marzo del 2015. Molina dice que correr es un desvío de la jubilación que ella pensó pasaría haciendo trabajo voluntario y cociendo. “Eso va a tener que esperar potencialmente otros cuatro años”, dijo, tocando madera en su escritorio de la buena suerte. El miércoles, Molina dijo adios durante su última reunión oficial como miembro de la Junta de Supervisores. Hubo discursos, elogios, abrazos, lágrimas y recuerdos en vídeo de ella y Supervisor Zev Yaroslawski, que también esta por salir de la junta. La ex secretaria del Trabajo, Hilda Solís será juramentada para reemplazar a Molina el primero de diciembre. El consejo de Molina a Solís es hacer lo que ella hizo y desarrollar su propio estilo y enfoque para hacer las cosas. “Quiero que ella continúe siendo una campeona, ella sabe cómo ser un campeona”, dijo Molina, quien agregó que espera que Solís hará un llamado a aquellos que han estado allí cuando necesite un consejo. “Espero que ella no crea que tiene que saberlo todo, porque a mí me tomó un largo, largo tiempo”. El lunes, la supervisora estaba siendo valiente ante su personal de su oficina. Había sido una semana emocional para todos; dividir un equipo que incluyó a personas que habían trabajado juntos durante décadas. “Es como si yo fuera la cabeza de este hogar tratando de ser valiente por ellos”, dijo Molina con los ojos llenos de lágrimas. “Pero por dentro, yo estoy tan nerviosa como ellos, preocupada de lo desconocido”.